Huzzah – my first Arbonne review! Now, I don’t know about the ‘main land’ (Isle of Wight dialect for the rest of the UK) but on the Island Arbonne is exploding. For those of you that don’t know, it’s an opportunity based company, which offers people the chance to start their own business as a local ‘Arbonne Consultant’, which is a little bit like Avon, but allows the consultant to have much more independence and control and a considerably reduced investment (start-up cost is just £50). They offer Spa Parties, which are basically home visits where you can test the products and receive spa treatments (for free!) They also have a very generous hostess package (to the tune of £65 worth of free products) and various different discounts. What I also think is fab, is that to order online, you need your local consultant’s PIN, which forces people to keep ‘shopping local’ and supporting their peers – yay! 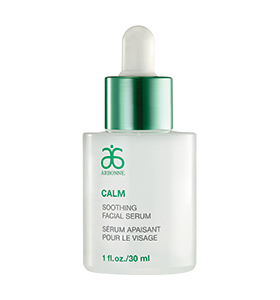 So, the first Arbonne range I will be reviewing is ‘Calm’, which as you may have guessed is aimed towards those with sensitive skin. I like to think that I don’t have much sensitivity, but I’m definitely not adverse to using products that are a little gentler and slightly less potent. Read on for my thoughts of the range! A very simple, gentle facial wash. There aren’t really an awful lot of thrills with this range; they are straight to the point – no funny business! I used about two pea sized amounts for my face and chin, which was plenty. The cleanser is foamy, but not OTT and no matter how much sniffing I did, there was absolutely no fragrance to be detected, and none listed on the ingredients. I know that sounds funny, but sometimes even seemingly fragrance free products have perfume on the list! I found this cleanser to be non-drying and it just does exactly what it says on the tin – cleanses your skin, leaving irritation at the door. I just rinsed off with warm water (not too hot!) and a muslin cloth with no exfoliation. That’s right! Straight to the serum… there’s no toner and the moisturiser is still to come. It feels a little strange, but not awful, just weird to break the habit! Because there was nothing in between, it was a little tricky rubbing the serum in. It was so easily absorbed by my skin it really didn’t go very far, and didn’t leave a very smooth surface to work with! Though it’s not all complaints, easily absorbed is like a dream-come-true for me, so I was happy with that! There are one or two questionable ingredients in this serum, but overall nothing to worry about, still a very, very low risk! Arbonne describe their less natural products as ‘Science’ ingredients, which to me feels a little sneaky, but not strictly false. All of the ingredients I didn’t recognise I googled, and there really isn’t a lot to complain about at all! The range also contains many beneficial ingredients such as Aloe, Mallow and Cucumber – all known for calming the skin. I really liked the consistency of this moisturiser, it wasn’t quite a gel, but was still a really easily absorbed cream. There is still no scent, and it was very soothing and gentle on my skin. Perfect for those, like myself, who struggle to absorb products like this. I found that a pea sized amount took care of my whole face, and left me smooth. I must say that my skin does feel very soft, and not the slightest bit dry. There is a tiny bit of residue, but that is to be expected for me, things normally don’t absorb completely for a couple of hours. I think I’ve mentioned that I’m not a make up wearer, though this morning I had the luxury of time to get ready, so I put on some mascara. Taking off make up is horrible for me, no matter how soft my cotton pads are, the process always scratches up my eyes a treat leaving them red and sore, with very rough skin (which usually gets stained by my make up) so it’s no surprise I normally steer clear of the ordeal and go bare faced. Today this exact thing happened, but I must say after applying this eye gel my orbital area is noticeably calmer, but is left a little sticky. If I were using this in the morning and wore make up regularly it certainly wouldn’t make a good primer for me! Left overnight however, I wouldn’t see a problem! The Calm range is recommended for use morning and night, and I would have to agree that it would be suitable for this. It is so incredibly gentle on the skin that it wouldn’t cause irritation if used regularly, though it’s probably good measure to keep use to a minimum with any products. Overall, this is a nice range, though I guess I look for a little more oomph in my skin care products and enjoy nice smells and textures! It is quite expensive, the calm set would set you back £90, which is an unthinkable amount of money for lil old me – I’d want nothing short of a miracle for that much money. Though it has to be said, with Arbonne you are almost guaranteed never to pay full price, most consultants let you into their world of discounts, so the price would inevitably drop considerably. Although for me it hasn’t made my shortlist, I can imagine that for those with really sensitive skin, this range is a no brainer. When they say gentle, they really, really mean it! If you fancy treating yourself to some Arbonne goodies, you can order online here. Have you tried Arbonne – what are your thoughts?